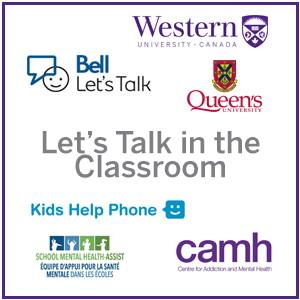 The Let’s Talk in the Classroom (LTIC) project is a collaborative initiative in partnership with Bell Let’s Talk, the Centre for Addiction and Mental Health (CAMH), Kid’s Help Phone, School Mental Health ASSIST, Queen’s University and Western University. The aim of the LTIC program is to better prepare Grade 7 and 8 teachers to effectively and confidently teach and talk to their students about mental health. More specifically the LTIC program is comprised of an interactive, online guide containing background information, resources and supports to prepare them to teach three lessons to their students. The three lessons are focused on destigmatizing mental health information, and teaching students how and where to find reliable mental health information and help for mental health concerns. Teachers will have the opportunity to work through the online modules engaging in the material through a variety of media formats, reflect on their learnings in an online journal, and share their learning experience with colleagues in the online community of practice, both before and after teaching the lessons. Interested Grade 7 and 8 teachers at participating school boards should reach out to the Mental Health Leads at their board for more information, or to participate in the project! Why does mental health matter at school? Note: These resources were developed specifically and are intended for the use of Grade 7/8 teacher participants in the Lets Talk in the Classroom project.